I never imagined I’d get over to the other side of the world, let alone Japan. On my first trip to Japan last December, I was amazed to realize that Buddhist culture – yoga – permeates everything. As a confirmed Buddhist and teacher of yoga, I was in heaven. I explored many Shinto and Buddhist temples in the Kansai region of Japan. The first being Shitennoji in Osaka. The Shitenno are the four heavenly kings of Buddhism. Sometimes regarded as the first Buddhist and oldest officially administered temple in Japan, the temple buildings have been rebuilt over the centuries because of fires. Founded in 593 by Prince Shotoku (572-622), the prince was known for his profound Buddhist faith when Buddhism was not widespread in Japan. After passing through the Stone Shinto Torii gate, there is the Saidaimon Gate. A dharmachakra wheel is there to touch after having purified yourself at the fountain. It’s beautiful turning wheel helps you realize this transition from sacred to profane, as well as let the symbol impess upon your consciousness. You touch the wheel, give it a mindful spin, then spin it once again when passing back through the gate on your way out of this sacred space. The dharmahakra symbolizes the Gautama Buddha’s teaching of the path to Nirvana, since the time of early Buddhism. Another of the symbolic meaning of the dharmachakra is the movement of the cosmic order, a cosmic order of which we are a part of. It cuts through samsara, sorrow and suffering. As the center of the wheel offers the axis, untouched by the outer world. 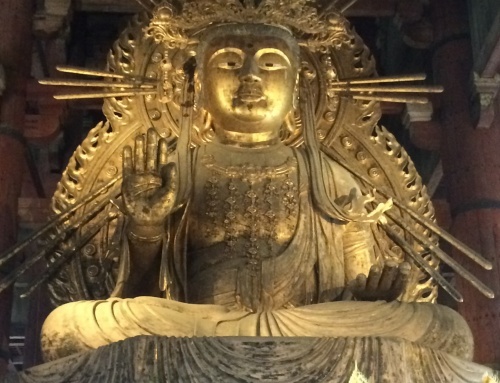 Enjoy this video poem I made as a meditation and haiku when I saw the dharmachakra at Shitennoji. May this visual poetry inspire you to practice meditation and use mythology, yoga and symbolism to deepen your own personal Mythic Yoga Journey™.